SHORT PRINTS: SP = 50-65% of standard print run, SSP = 40-50% of standard print run, MSP = less than 40% standard print run. Parallels for Josh Bell, Michael Kelly and Zach Cone are as follows: Blue #/99, Purple #/25, Yellow #/10, Black #/5, Red 1/1. 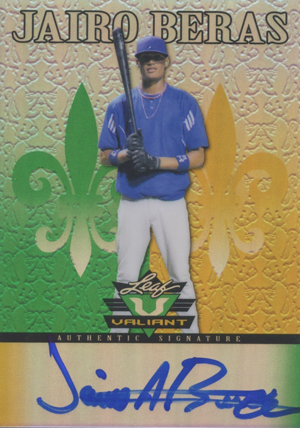 Regal rainbows return in 2012 Leaf Valiant Baseball, an all-autograph release driven largely by prospects. Using a design similar to last year's, every card in the release comes with an on-card autograph. The majority of the checklist centers around baseball's young stars and top draft picks. However, like 2012 Leaf Metal Draft Baseball, the set also includes Albert Pujols and Pete Rose. Pujols' cards include an extremely limited number of inscriptions like "The Machine" and "Alberto Pujols." Base autographs have several colored parallels that are numbered to either 99, 25, 10, 5 or 1. Every 12-box case of 2012 Leaf Valiant Baseball comes with a hot box that is nothing but numbered parallels. Hot boxes are marked on the outside. New to 2012 Leaf Valiant Baseball are redemptions good for pieces of autographed memorabilia. Pieces include signed bats, photos, balls, checks and more. Every 2012 Leaf Valiant Baseball box comes with ten autographed cards. 2012 LEAF VALIANT # VASP1 STEPHEN PISCOTTY YELLOW- AUTO RC PSA 10 ** READ DESC. This design isn’t exactly for me, but that checklist of great prospects with their first appearences- really impresses me. I think soon people will look back at this being a sign that Leaf deserves some more cred. This is an excellent product. Nice clean cards. Leaf did their homework concerning prospects. I find the clean signatures at the bottom of the card very appealing. I think the boxes are priced very reasonable compared to other autographed products on the market. OUTSTANDING product, in my opinion!